iRealHousewives | The 411 On American + International Real Housewives: Xscape: Still Kickin’ It Premieres On Sunday, November 5 — Watch The Official Trailer, Cast Bios And Photos HERE! 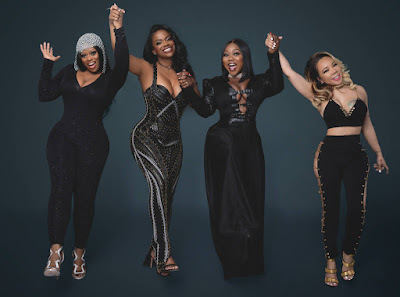 Xscape: Still Kickin’ It Premieres On Sunday, November 5 — Watch The Official Trailer, Cast Bios And Photos HERE! Kandi Burruss will be reuniting with her former band mates from Xscape, LaTocha Scott, Tameka "Tiny" Cottle and Tamika Scott this fall in their own docu-series called Xscape: Still Kickin' It, which premieres on Sunday, November 5 at 9pm/8c on Bravo. In the four-part special, the ladies prepare to take the stage after nearly 20 years apart. However, the road the get there won't be as easy as they vision. Check it out below! “Xscape: Still Kickin’ It” is produced by Truly Original and Monami Entertainment. Steven Weinstock, Glenda Hersh, Lauren Eskelin, Lorraine Haughton-Lawson and Thomas Jaeger (Truly Original) and Mona Scott-Young and Stephanie Gayle (Monami Productions) serve as Executive Producers. Kandi Burruss, Tameka “Tiny” Cottle and LaTocha and Tamika Scott also serve as Executive Producers. Kandi Burruss is a Grammy Award-winning singer/songwriter who resides in Atlanta with her 14-year-old daughter, Riley, 20-year-old stepdaughter Kaela, and husband, Todd Tucker. Putting her music on hold to make family her number one priority, Tameka "Tiny" Cottle is keen on relaunching herself in the industry, but just as her music career is on the rise her marriage is tested. LaTocha Scott is all about focusing on the group and pushing them to the next level of super stardom. Tamika Scott, who continued in the industry over the years is looking to get back to her roots with where her music career all started. Xscape: Still Kickin' It premieres on Sunday, November 5 at 9pm/8c only on Bravo.